Written by Italo Calvino and published in 1972, Invisible Cities is a collection of page-long descriptions of cities, as described by Marco Polo to Kublai Khan. The two men do not have a common language, so we realise that Polo is describing his travels using not only words, but hand gestures and props to make himself understood to his host. The novel, written originally in Italian, is incredibly vivid and explores our imagination. It’s complex, but there’s an enjoyment to be had from just reading it at face value without adding your own interpretation or thinking about it too deeply. Although the cities are described in a clearly exaggerated way, the images are too intense for them to be totally made up…. This is definitely worth reading – it’s totally captivating and although there’s no plot as such, it’s almost impossible to put down. Also, you look kind of intelligent reading it on public transport, which is always nice. 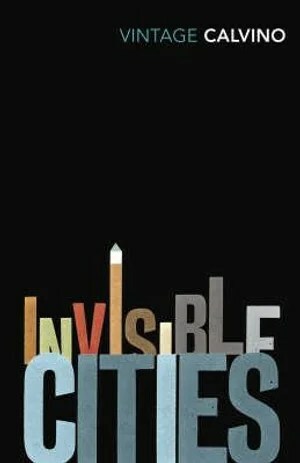 Written by Italo Calvino and published in 1972, Invisible Cities is a collection of page-long descriptions of cities, as described by Marco Polo to Kublai Khan. The two men do not have a common language, so we realise that Polo is describing his travels using not only words, but hand gestures and props to make himself understood to his host. The novel, written originally in Italian, is incredibly vivid and imaginative. Although the cities are described in a clearly exaggerated way, the images are too intense for them to be totally made up…. This is definitely worth reading, and can be read at face value or interpreted however you like. It’s totally captivating and although there’s no plot as such, it’s almost impossible to put down.